Congrats on your new book! 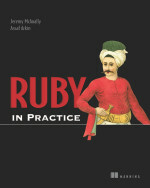 I am partway through your Humble Ruby Book and enjoy your writing immensely. I think you strike a fine balance between being precise, concise, and entertaining. The size of the book is also quite unintimidating (a big book of information which is never read is useless). I'm looking for your Ruby on Rails book ("relevant ramblings"?) and getting a "Rails application couldn't start message" on the rubyonrailsbook.com site (which is not exactly a ringing endorsement for either) but HEY, stuff happens. Thought you'd want to know. If you can point to whereever your sample chapter is now, I'd be grateful. Thanks! Really good. I didn't finish it yet, but I'm on my way to do that. It's my first approach to Ruby. And I loved the entertaiment part, really funny. Ahh, by the way, I'm not going to buy my paper book, so I already donate. Not that you are interested in this little item, but I wanted to mention it. You are looking so happy and very motivated because of you able to complete one more book. I read your previous book and you did a great job but custom rushessay writing service provides authentic info. Now I will download your new book and want to read it. I am sure you nailed it this time. I love you. I never got to buy any of your books, even though I read all the preview (or whatever they are called) pieces. Probably I'll get to it as soon as finish with AcadWrite.